The first part of Michael Yang's article on the 13th session of the US Chess School featured words of wisdom and lessons by GM Yasser Seirawan and IM John Donaldson. 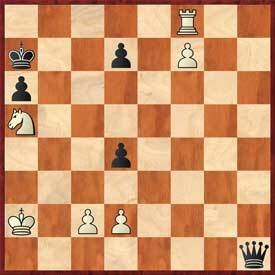 On day 4, we looked at a quick game, Quinteros - Seirawan, which featured a classical Bxh7 sacrifice, although the game was misplayed by White. After that, we had a round-robin blitz tournament among the US Chess School participants, David Golub, Jordan Pamatmat (Jarod's younger brother), and Carl Harmon-Vellotti (Luke's older brother). 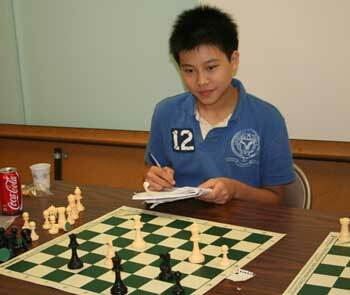 Congratulations to Kevin Wang, who won the tournament with a spectacular score of 10.5/13. I came in second, Luke Harmon-Vellotti took third, and Yian Liou got fourth place. Kevin and I won the right to play two five-minute games with GM Yasser Seirawan. Luke and Yian won the right to play two five-minute games against IM Greg Shahade. During the day, each camp participant went into a separate room for a consultation with Greg and Yasser. Yasser and Greg discussed our strengths, weaknesses, and development plan for each of us. I found my session extremely helpful. We later looked at two games, Kasparov - Karpov (World Championship match, round 20, December 15, 1990), and Polugaevsky - Nezhmetdinov . The Nezhmetdinov game is very famous, and Yasser told a short anecdote of how he had once talked with Lev Polugaevsky. On asking Lev about the Nezhmetdinov game, Lev said he had won three games against Nezhmetdinov, drew one, and lost two. Unfortunately, no one knows about the games he won! The last day of the 13th US Chess School was my favorite day. We started the day off with a problem solving competition. Greg Shahade set up 20 positions, and after 1 hour 30 minutes, whoever had the most correct answers won the competition, and earned an invitation to the next US Chess School in Los Angeles. With a big prize at stake, the problems were very difficult. In the end, Yian and Luke were the winners. Congratulations to both of them! Test yourself on some of the problems. Upon finishing the competition, we took a break for lunch. Kevin Wang and I went to McDonalds, where, to our utter bemusement, we were handed a job application form by the cashier. Apparently he thought we were local teenagers who might need a job! Once lunch was over, we played a very fun and tense consultation game. The teams were chosen randomly, and colors determined by coin flip. The team playing White would be allowed to ask IM Greg Shahade for advice three times during the game, while the team playing Black would be able to ask Yasser Seirawan for advice three times. The game was played with 45 minutes for each side, with a 30 second increment. White: Mika, Michael W., Yian, Kevin, Michael O. We're out of book. 9...Qc7 is the standard move. 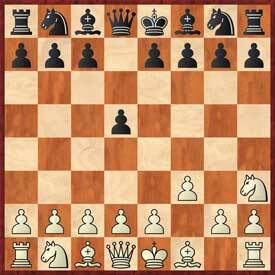 13...Nf5 14.Bf4 Rc8 15.Qd2 Kh7 16.Bh3? White does not want to trade his bishop for Black's Nf5. 16.Nxh6 doesn't work 16...Bxh6 17.Bxh6 Nxh6 18.Ng5+ Kg7; 16.Ng5+ also fails 16...hxg5 17.hxg5 Rh8 18.Nf6+ Bxf6 19.exf6 Kg8 20.g4 Nd6; 16.Kh2!? 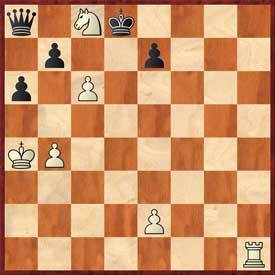 17.Qe2 is better, with the idea of Nf3-d2-e4-f6 17...c4 18.Nd2 cxd3 19.cxd3 Nb4 20.Ne4 Rc2 21.Qd1 Rxb2 22.Ngf6+ Kh8 23.a3 Nd5 and White at least has some counterplay. 17...c4 18.Bxf5 exf5 19.g4 c3 20.bxc3 dxc3 21.Qc1 Ne7! 22...h5 23.e6 Bb7 24.Be5 Nc6 25.Bxg7 Kxg7 26.Qf4 Qd5 27.exf7 Rxf7 28.a3! 40...Qg7 41.Qb8+ Kh7 42.Qxb4 c2 43.Qa3 Bxf3 44.fxe3 Qc7! Once the consultation game was over, the blitz matches with Yasser and Greg were played. Greg scored 3.5/4. Yasser scored 3/4. Beforehand, Kevin and I had arranged a "strategy for beating Yasser." We would both play Yasser as Black, so then he would have to finish the day with two games as Black, not the most pleasant thing. I played Seirawan first. 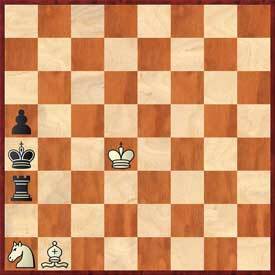 In a complicated Benoni, I somehow managed to equalize into a theoretically drawn endgame. Then I messed it up and lost. Kevin played a Queen's Gambit Declined, and Yasser caught him with a "very old line" (Yasser). 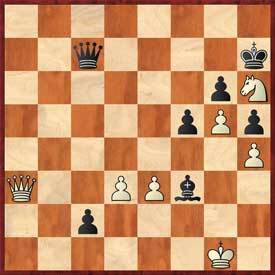 My second game against Seirawan was a Kings Indian Attack. Yasser mistakenly traded a piece for two pawns, though he had compensation. A gift from Caissa! I ended up winning the game, one of the happiest moments of my life. I received a round of applause for my accomplishment. Best of all, my dad recorded the whole game on video! When Kevin played his second game against Yasser, the opening was the Caro-Kann, an opening which Seirawan is an expert at. Kevin lost the game. In my opinion, Yasser's unique teaching style allows him to easily connect with students, giving us a better understanding of basic principles which we had already internalized; in effect, taking our chess to the next level. Combinations, combinations, combinations, as you can see, were the key subject for this camp. Just a word of warning: if ever paired against one of this camp's participants, watch the combinations! We're also good at standing on one-leg, as evidenced from the photo below! Now I will share with you some more information about this session's players. Yian Liou is 13 years old. He hasn't been to daycare in years. 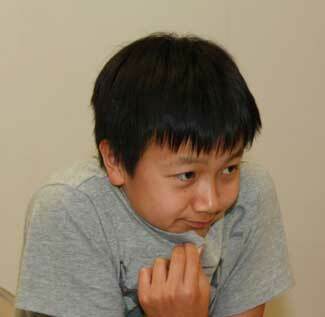 However, when he was six years old, he learned to play chess in a daycare center. Since then, he plays often on ICC, or just studies chess. Let's hear Yian on chess and life: "People may think I'm very tactical, but I enjoy positional struggles more than tactics. Openings are something that I can improve on a lot, and a similar thing can be said about my endings. I enjoy tennis, soccer, track, and occasionally play the piano." Yian made a small confession to me which I hope he doesn't mind my sharing. He has found a new favorite event in track and field, the high jump! This was Yian's first chess school, and he says he enjoyed just about every aspect of the camp. From this camp, Yian says he's learned how to play in many different positions (e.g. closed positions, sharp positions, etc.) He says his favorite part of the camp was the barbecue we had at sponsor Dr. Jim Roberts' house. I knew Yian from the US Cadet Championship held in Crossville, Tennessee a month ago, where we both tied for first place. When I was six and a half years old, I learned chess from a computer program "Chessmates". Like other young chess players, I had spent quite a bit of time on chess and travelled to many cities for tournaments before high school. I am a three-time Minnesota high school chess champion and two-time second place finisher at the Denker tournament. My favorite part of chess is winning, particularly with a beautiful sacrifice. I like singing, swimming, running, and lifting weights. Spending five days with a legend of chess, GM Yasser Seirawan, was a really rare and valuable opportunity which I will cherish for years to come. After this camp, I feel not only an increase in my chess playing abilities, but also inspired by Yasser. I have attended one US Chess School in 2008 (coached by the excellent Yury Shulman), and believe that attending the US Chess School will bring an increase in playing strength to any participants. 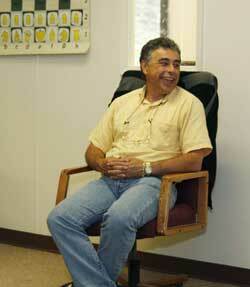 My favorite part of this camp was the instructor, Yasser Seirawan, and the friends made. 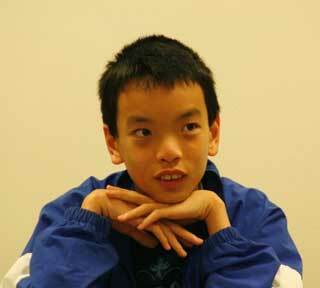 Kevin Wang first got into chess when he was six years old. Like all young kids of that age, he went to the mall to play chess. Nowadays, he plays several hours every day. Kevin has been to one US Chess School before. It was in 2008, San Diego, and taught by GM Gregory Kaidanov. 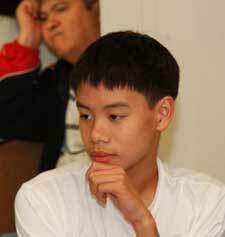 He liked that camp because it helped him understand the positional aspects in chess. Kevin also liked this camp because "Yasser is an exceptional teacher, the many friends I got to meet, and the new combinations I learned. Probably my favorite part was the extremely interesting and exciting games of Yasser's." Until I asked, I had no idea that Kevin was 12 years old. He's taller than me (I'm about 5'9'') and everyone else at the camp. I thought Kevin was a very solid player, with a balanced understanding of chess. Kevin's other activities include tennis and clarinet. 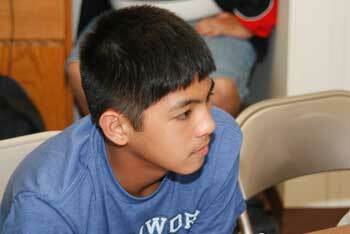 I had met Jarod Pamatmat two times before this camp, the 2009 and 2010 US Cadet Championship. 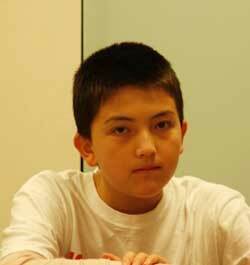 Jarod has attended one US Chess School before, which helped him improve his chess. For this chess school, Jarod liked playing bughouse and guessing the next move in Yasser's games. His favorite part was the consultation game, which was won by our team. Jarod first learned chess when he was five. He was taught by his dad. Jarod plays two or three times each month. His favorite part of chess is tactics. Other than chess, Jarod also plays football, basketball, tennis, piano, and trumpet. Luke Harmon-Vellotti is eleven years and lives in Idaho. He is ranked 1st among 11 year olds. Luke has been to three(!) US Chess Schools before. This was his fourth US Chess School. My impression of Luke was a very sharp player, often being first to come up with the right solution in any given position. Luke's website is www.SponsorLuke.com. Luke: "I liked this camp so much that I think it was my favorite! I think that this camp has helped me improve for a variety of reasons the most important being that for a combination to work, you have to have some sort of advantage. So, I especially liked this camp because Seirawan did a lot of lectures on combinations. My favorite part about this camp was beating Greg and getting that one-year free on ICC. I first learned chess when I was 4 years old and my dad taught me how to play. I play in USCF rated tournaments about once a month and I study every day. My favorite part about chess are those beautiful combinations. I really try to remember that it is the quality of the game, and not whether I win or lose that is the most important part (GM Timur Gareev told me that!). I also like to play basketball, swim and play tennis." Michael Omori says his 2110 rating is "pretty low", a statement many people reading this article would disagree with. He does have a "high" FIDE rating of 2240 though. 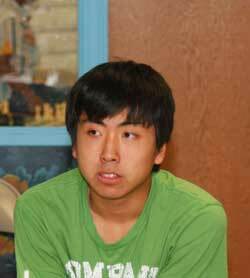 Michael Omori first learned chess when he was five years old. His dad taught him the game. Michael Omori: "I play on ICC a little every day, but tournament play, maybe a tournament every month. My favorite part of chess is finding creative ideas during all parts of the game, especially while attacking. The one main other activity I play is tennis. I also like ultimate Frisbee, ping pong, biking, and basketball. And I love video games." Michael hasn't attended the US Chess School before. "I liked the camp. It has helped me improve my, hmm, combinations. The best part about the camp was going to Crossroads and eating. Just kidding. I think Yasser's charisma was what made the long camp interesting and his storytelling skills. And I really liked the endgame challenge and the bughouse and blitz. It was also helpful when we worked together in small groups to find the best move in a position." 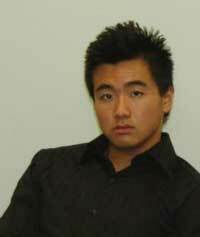 Michael Omori excelled at Frisbee, football, and bughouse. Not to say that his chess was bad, quite to the contrary. During the camp, we came up with some very interesting bughouse ideas which I can't resist publishing here and in effect, "patenting." Disclaimer: Any losses resulting from the playing of the below-mentioned ideas is not our responsibility. 1. Nh3! (threat Ng5) d5 2. f3!! 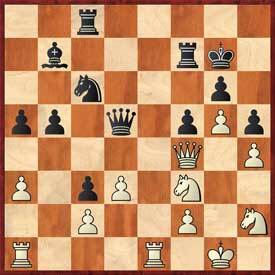 (idea Nh3-f2) if White can bring his knight to f2, then he follows up with e2-e3, d2-d4, and a very solid position. So 2... Bxh3 3. gxh3 - 4. [email protected] Rg1 is coming, and White retains a very solid king position. 1. e3!! Ever wanted to play as Black when you're White? This is your move! Michael Wang (with three Michaels at the camp, and Yang and Wang sounding so similar, life got pretty confusing at times) first learned to play chess in kindergarten at his school's chess club. He says he was probably 5 or 6 years old at the time. Since then, he's never stopped playing. He plays in tournaments several times each month. Michael Wang says: "My favorite part about chess is the fun involved with creating combinations and trying to beat the opponent. I enjoy the competitive nature involved with each and every chess game. Besides chess, I play a wide variety of sports, mainly basketball. I like moving around and staying active." This was Michael Wang's first US Chess School. Michael Wang's thoughts on the camp: "Being able to meet really good chess players my age from all around the country was a really cool experience--being able to interact and play against tough competition helped me in improving my chess and knowing what I had to do in order to get better. Chess is fun- so; being able to learn and have fun at the same time was very likeable. Plus, getting a chance to meet and learn from a world-class chess player like Yasser is a once-in-a-lifetime experience that I will always remember. My favorite part about this camp was probably listening to Yasser's many interesting life experiences and playing blitz/bughouse with other students at the camp. Hanging out and getting to know other top chess players in the country was really fun." Michael Wang is one of those rare people who manages to make everyone laugh without any effort at all. Always smiling, his presence made the camp that much more enjoyable. Nathan Lee's cousin Megan also attended this camp. Chess talent is definitely in the family! Throughout the whole camp, Nathan took all chess-related activities (except perhaps bughouse) very seriously. For example, during the consultation game, he was very helpful, constantly checking and double-checking variations "just to make sure." Nathan has never been to the US Chess School before, but says he liked everything about the camp except the problem solving competition on the last day. Megan Lee is ranked 23rd for 13 year olds, but she is also ranked 5th for under 16 girls. Megan, like her cousin Nathan Lee, always showed up to camp with her notebook, which she took notes in. However, she also drew some very good pictures of chess pieces on napkins. An interesting fact about Megan is she won a math/logic contest from a previous US Chess School article. She shared some very hard logic puzzles during the blitz tournament, most likely a crafty attempt to baffle her soon-to-be opponents. Just kidding Megan! Megan: "I have previously attended the 10th USCS which was compiled of 8 girls from around the country after winning the 6th Annual All Girls Nationals U18 section. I really enjoyed the USCS as it has helped me improve in my chess in all aspects - from positional to tactical combinations as well as learning how to avoid problems with chess that most people have, such as time pressure. In this USCS, I liked meeting new people as well as analyzing in groups, which helped cover what I had missed in my analysis. I also enjoyed the fact that some people I already knew (four locals, including me) had been invited too. My favorite part of this camp was the consultation game as my group (Luke Harmon-Vellotti, Nathan Lee, Jarod Pamatmat, and Michael Yang) had to work together and strategize with Yasser Seirawan for three chosen moves, in which my group was able to come up with a competent plan. We later won. I play chess when I'm available, and I usually attend larger out-of-state tournaments when they come around. I first learned chess probably from my brother and dad, later joining my school's chess club in my 1st grade year at the age of 6. 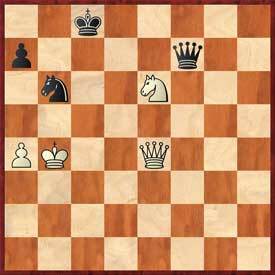 My favorite part of chess is being able to pull off a combination successfully. Besides chess, I swim and play the piano." 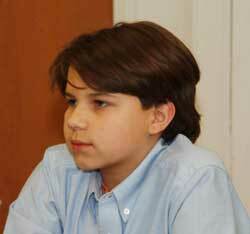 Mika Brattain first learned chess when he was 6 years old. Mika and his dad learned how to play chess from a book in the local library. Five years after learning the rules to the game, his unofficial rating is 2033. He plays about 2 tournaments per month. Mika's favorite part of chess is the scholastic competitions where he gets to play people his own age. He also thinks chess is a good strategic game. For the past three years Mika has done robotics projects and participated in (robotics) competitions with his robotics team. He also plays sports, but especially likes basketball. 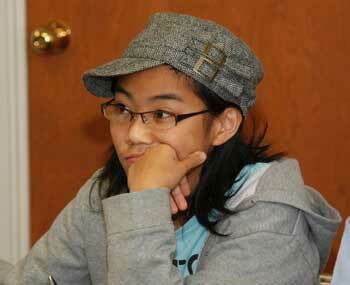 Let's hear Mika's thoughts on the US Chess School: "The US Chess School in Seattle was a good experience. It helped me improve a lot. Yasser's tactical positions are a good challenge and very useful, while Greg's study of our games helps you to be very thoughtful of what you play in a game. John Donaldson's analysis of games proves to be very instructive (i.e. ideas on handling IQP positions and exchange sacrifices; how piece values can be irrelevant). "What I liked about this camp is that I was able to learn a lot in a short period of time. We were able to cover a lot of material, and the days were broken up into fun learning and playing sessions. My favorite part was the game John Donaldson showed where Black sacrificed two exchanges and won. I have attended one previous US Chess School in Dallas, Texas. 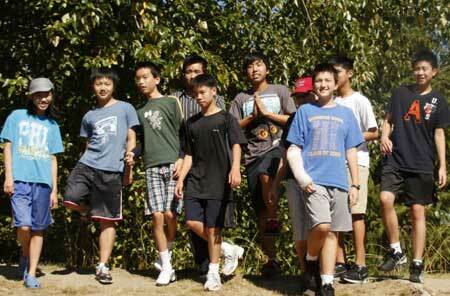 Both experiences have helped me improve, but the Seattle camp was more advanced." Mika was one of the most focused participants of the camp, asking many questions in order to expand his chess knowledge. "My hope for the camp was to do ‘no damage.' To better explain myself I mean that I take it for granted that all the students who attended were truly gifted already, that they have passion for the game and what I hoped to do was merely to fan those flames of passion with some inspiring games and sharing a different perspective to combinations and tactics." On behalf of all the US Chess School participants, I would like to thank Dr. Jim Roberts, the sponsor of the US Chess School, who also courteously invited us to a barbecue at his house; NM Elliot Neff, the founder of Chess4Life, who is devoted to supporting chess education for kids; IM John Donaldson, for taking the time to come and teach us; Eddie Chang, a local player who came and helped out everyday, in every area from clean-up to pictures to blitz/bughouse partner; IM Greg Shahade, organizer of all 13 US Chess Schools and organizer of the US Chess League, who also gave me the opportunity to write this article; and last but not least, GM Yasser Seirawan, a chess legend, who gave us a true gift and once-in-a-lifetime experience. We were all honored, as chess players, to have Yasser Seirawan with us. Finally, I would like to thank all our parents for supporting our chess endeavors. Without you we would not have gotten where we are today. Thanks Mom and Dad! For more on GM Yasser Seirawan, pick up his recent book, Chess Duels: My Games With the World Champions, at the USCF store. For more on the USCS, see the US Chess School website and the first part of this article.